Helps reduce pool/spa chlorine and chemical usage. A Floating, Solar UV Sanitizer, with BioPhotonX™ UV Light Conversion Technology. captures and magnifies ultraviolet light, breaking down a portion of the water molecules and creating Free Radicals. 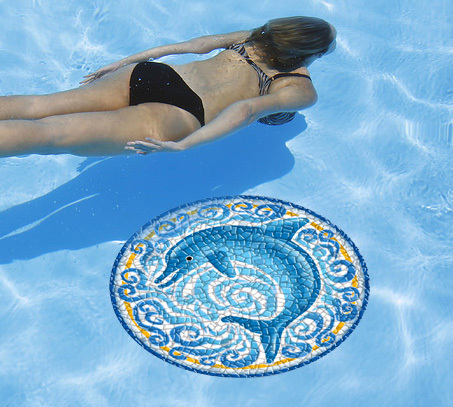 These active Free Radicals attack, weaken and inhibit reproduction of algae and bacteria, allowing you to use less chlorine or bromine and fewer chemicals, in your residential pool or spa. Scroll down to browse through information on Card On Guard Floating Solar UV Sanitizer, an easy way to reduce overall residential pool or spa chlorine or bromine usage. The Website Store Directory contains an alphabetized listing of all products for sale. The Website Store Directory contains an alphabetized listing of all products for sale. We don't just sell products. We help you make a better-informed choice, by providing all the information, you might require. Need ordering help? Scroll down the page, for the Order Desk Telephone Help Number. All items ordered will end up in the same shopping cart, no matter which page of this website, the items are located. All Major Credit Cards and PayPal are accepted. Order one today. Just place the Card On Guard Floating, Solar UV Sanitizer in your pool or spa and let it float off and start producing Free Radicals. This product does not eliminate the need to add chlorine or bromine, but reduces, by 50% or more, the amount required to maintain any given free chlorine or bromine level. One week, after introducing Card On Guard, to your pool or spa, reduce your chlorine/bromine additions by 50%. Because, Card On Guard does much of the work controlling microorganisms, more of the chlorine or bromine is available to destroy organic wastes and inhibit bacterial and algal growth. This new technology has won a host of awards. The Card on Guard, Floating UV Sanitizer is easy to use!!! Make sure that the free chlorine is 1-3 PPM or, if using bromine in a spa or hot tub, make sure the level is 3-5 PPM. Maintain other water chemistry factors, as necessary. One week, after placing Card On Guard, in your pool, spa or hot tub, reduce the normal amount of sanitizer additions, by 50% or more. Check the free chlorine or bromine levels, on a regular basis, and adjust, as necessary. However, always try and keep the free chlorine at 1-3 PPM and the bromine level at 3-5 PPM. Card On Guard also helps maintain a more stable pH level, by reducing overall chemical additions. As always, sanitizer requirements are influenced by bather usage and seasonal differences, so be sure to monitor the chlorine/bromine and other water chemistry parameters carefully, for best results and fewer problems. This Floating Solar Sanitizer uses BioPhotonX™ UV Light Conversion Technology to capture and magnify ultraviolet light, breaking down a portion of the water molecules and creating Free Radicals. The active Free Radicals attack, weaken and inhibit reproduction of algae and bacteria. This enables you to use less chlorine or bromine and fewer chemicals. Suitable for residential pools or spas, up to 15,000 gallons in size. It is not an ionizer or mineralizer, which would add metallic ions. It adds nothing to the water. Ultraviolet (UV) light provides the energy to create the Free Radicals, which act in concert, with chlorine to bromine, to achieve better results, while using fewer chemicals. Floats vertically, with most of the unit submerged, so about all you'll see is a "fin". Click the monitor, on the left, to view an informative video. ● Treats residential pools and spas , up to 15,000 gallons. ● Saves money, by reducing chemical usage. Lasts 1-2 seasons. ● Internationally recognized technology has won multiple awards. ● Solar panel uses UV light to convert water into Free Radicals, which quickly react with organic wastes, chloramines and inhibit bacteria and algae growth. ● As little as 10 minutes of ambient or sunlight, a few times a week, keeps the unit charged and functioning. ● Easy to use. Nothing to hook up or assemble. Requires no electricity. ● Less maintenance, because of fewer overall chemical additions. ● Does not eliminate the need for chlorine or bromine, but enables reducing the chemical additions, by 50% or more, depending on actual bather usage. ● Better for the environment. Releases no chemicals into the water. ● Healthier, more natural and comfortable bathing, because of reduced chemical additions and the elimination of odorous and irritating chloramines. ● Unit size: 19" x 12" x 1" Unit weight: 1.25 -pounds. ● Shipping size: 22" x 17" x2" Shipping weight: 3-pounds. Don't put up with chlorine or bromine shortcomings . . . use less and get better results!! !